The best thing I ever did for my family was to get us all into sailing. There is nothing like being out on the open water, wind at our backs as we all work together to make our vessel go. It all started out innocently enough. I was killing myself at work, and my wife suggested that I find a hobby to take my mind of it a bit. I did some research, asked around, and decided I would try a sailing class. As soon as I felt the wind hit the sails, I was hooked. I rushed home after the class and convinced my wife and kids to go with me next time. That was all it took. Three months later, we bought out first sailboat. And now, years later, we have upgraded a few times until settling on the boat we have now. It is a pretty good size, but with our combined experience, we handle it quite well. While we love our sailboat, and think it is perfect for our family of four, its size sometimes presents problems. It is a bit too big to dock everywhere we want to go, but a bit too small for a traditional dinghy that we could use to shuttle us all to shore. I was doing some research to see what other people with boats our size did, and I stumbled across a solution when I got to BoatstoGo.com, which sells many types of inflatable boats. After searching through their selection for a little while, I settled on the perfect dinghy for my family. It was the 9.6’ SD290 Saturn Inflatable Boat, and it fit our needs to a tee. For starters, the Saturn SD290 inflatable dinghy boat is the perfect size for my family, with the ability to tender all four of us ashore in one trip as our sailboat remains anchored out at sea. We store it on the boat, deflated, in the convenient bag it came in. It takes up almost no space at all! Then, when we want to use it, we pull it out, attach the pump, and it becomes the perfect inflatable boat for us in just minutes. 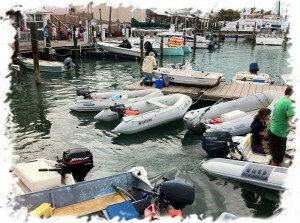 We even have small, 10 HP outboard motor that is easily attached, so we don’t have to paddle. Another major benefit of having the Saturn SD290 (my wife loves this) is that it doubles as a life raft in case we run into any trouble out on the water. Made out of 1100 denier PVC fabric, this inflatable boat is incredibly resistant to any tearing or puncturing. In fact, when I compared the vessels from BoatsToGo with other inflatable boats, I found that most other brands had only 1000 denier PVC boats, which are not as strong. The SD290 also has separate air chambers, so on the off chance that it does get a puncture, only one air compartment will deflate. Thankfully, we haven’t had to use our inflatable boat as a life raft yet, but it’s good to know it’s there just in case. If you add up all the benefits of our new inflatable boat, you’d think it cost us a small fortune. But maybe the best part about purchasing inflatable boats from BoatsToGo is the price. These watercrafts are extremely affordable, especially when compared to their hard hull counterparts. Good thing I did some research, because finding this 9.6’ SD290 Saturn Inflatable Boat has made our already great family sailing trips even that much better and safer!